Here it is, the complete version of the 2017 All-TriState Football Team. 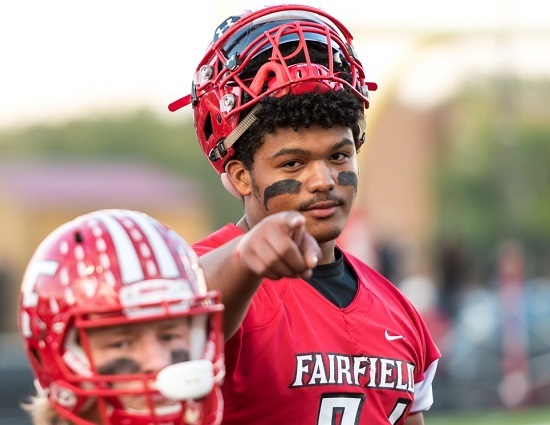 Fairfield’s Jack Carman and Malik Vann as well as Zach Carpenter, Cam Butler, Mason Parris and Cris Oats repeat as Frist Team selections. QB – Josh Anderson (New Richmond), Seth Becker (Bethel-Tate), Jordan Fann (Lloyd Memorial), Alec Grandin (Centerville), Kenny Mayberry (Winton Woods), Matt Shearer (Simon Kenton) and Markell Stephens-Peppers (Trotwood-Madison). RB – John Bivens, III (Alter), Alex Dowds (Campbell County), Devin Kenerly (Northmont), Logan Storie (East Central), Cameron Svarda (Madison Senior), Bailey Wallen (Brookville) and Miyan Williams (Winton Woods). WR – Bryant Johnson (Butler), Cameron Specht (St. Xavier), Jake Spiewak (Centerville), Nick Venemann (Highlands), Austin Watt (Anderson) and Andrew Wittrock (St. Xavier). TE – Brenden Bates (Moeller) and Justin Brown (East Central). OL – Conner Barton (Wilmington), Noah Hammond (Franklin County), Peyton Knippenberg (Conner), Alex Mumy (Bellbrook), Adam Valenti (Valley View) and Kairus Washington (Dixie Heights). DL – Tyler Bentley (Lakota West), Jowon Briggs (Walnut Hills), Shane Cokes (Chaminade Julienne), Adam Derry (Beechwood), Bryce Dugan (Milford), Jackson Gear (McNicholas), Cole Pelgen (Madison Senior), Jalen Thornton (Indian Hill) and Sam Vance (Centerville). LB – Seth Arnold (Dunbar), Jake Bracher (Mason), Bradley Davenport (Bishop Fenwick), Logan Hannah (Valley View), Mick Oakes (Indian Hill), Jackson Saladin (Ryle), Ben Schmiesing (Piqua), John Wehrkamp (Troy) and Seth Yunker (Dayton Christian). DB – Joey Floccari (West Clermont), Jake O’Brien (Elder), Deshawn Pace (Colerain), Kievaughn Sanks (Aiken), Justin Schlarman (Cooper), Patrick Tueimeh (Sycamore) and DJ Whiles (Edgewood). ATH – Cornell Beacham (Winton Woods), Tywon Berry (Dayton Christian), Justin Blackburn (Ludlow), Cole Burdick (McNicholas), Daniel Mescher (Beechwood), Ivan Pace Jr. (Colerain) and Tim (Williams) Aiken. PK – Sergio Listo (Wyoming), Connor Luksic (Springboro) and Julian Pletz (Edgewood). P – Joe Collins (Summit Country Day) and Matt Simpson (Conner). RET – Sam Hildebrand (La Salle), Austin Price (West Clermont) and Donovan Shelton (Centerville). QB – Connor Bazelak (Alter), Brayden Burch (Beechwood), Elijah Carson (Meadowdale), Austin Davis (Piqua), Cole Dein (Indian Hill), Brian Erbe (Oakwood), Andre Gordon (Sidney), Trey Heidlage (Batesville), Austin Hoeh (Campbell County), Miles Johnson (Northmont), Blake King (Milford), Gunnar Leyendecker (Colerain), Alex Maxwell (East Central), Rashad McKee (Wayne), Griffin Merritt (La Salle), Ryan Peltier (Chaminade Julienne), Evan Prater (Wyoming), Kyle Proffitt (Goshen)Danny Vanatsky (CHCA), Sean VanNoy (Dayton Christian), Jamar Walker (Dunbar) and Frankie Young (Harrison). RB – DJ Ames (Wilmington), Cole Barhorst (Tippecanoe), Kyle Blaha (Anderson), Fred Brown (Riverview East Academy), Tony Clark (Miamisburg), Keegan Corbett (Bishop Fenwick), Jaydon Culp-Bishop (Troy), James Davis (Beechwood), Jesse Deglow (Fairmont), Malcom Devine (Mason County), Dalton Dubois (Connersville), Martis Edwards (Gamble Montessori), Logan Flatt (Butler), TJ Gelter (New Richmond), Collin Genslinger (Valley View), Eli Gibson (Preble Shawnee), Tennyson Holmes (Indian Hill), Cole Joslin (Clermont Northeastern), Kyle Kelly (NewCath), Corey Kiner (Roger Bacon), Austin Maham (West Clermont), Elijah Malcolm (Belmont), Lavassa Martin (Badin), Travon Mason (Lloyd Memorial), Casey McGinness (Covington Catholic), Ryan Montgomery (Franklin), Quincy Perrin (Scott), Wade Phillips (Edgewood), Cameron Porter (La Salle), Christian Poynter (Clinton-Massie), KJ Redmon (Fairborn), Ben Scott (Harrison), Tyrese Sherman (Princeton), Zac Shields (Milton-Union), Jimmy Strunk (Goshen), Alex Vianello (Mariemont), Sincere Wells (Xenia), Kaden Wenger (Beavercreek), Nak’emon Williams (Kings) and Courtney Woodward (North College Hill). WR – Jake Berkemeier (Oak Hills), Logan Castleman (Beechwood), Bryce Donnelly (Bishop Brossart), Cooper Dunn (Bethel-Tate), Fisher Hayden (Simon Kenton), Hunter Jessee (Kings), Caleb Johnson (Springfield), Tyler Johnson (Miamisburg), Amadaz Jones (Anderson), Chandler Kinhalt (New Richmond), Dashawn Lawrence (Taft), Jonathan Malek (Sycamore), Logan Mantz (Goshen), Jack McCracken (Moeller), Jabari Perkins (Northmont), Malachi Pike (Covington Catholic), Rae’Quan Prince (Winton Woods), Titus Ransom (Bourbon County), Colin Shaw (Indian Hill), Hayden Shrubb (Piqua), Brendan Talarczyk (Oakwood), Kyle Trischler (Elder), PJ Varnadoe (Valley View), Nick Venemann (Highlands), Adam Wieczorek (Madeira), Myron Williams (Sycamore)Eric Wills (Moeller), Justin Wise (Kings), Jaylen Zachery (Thurgood Marshall) and CJ Young (Harrison). TE – Stefan Clarkson (Ryle), Jack Cravaack (Madeira), Connor Foster (Milford), Derek Hite (Piqua), Spencer Klopfenstein (Troy), Mason Kramer (Campbell County), Logan Mears (Batesville) and Devin Milton (New Richmond). OL – Derrian Anderson (Taft), Andrew Arnold (Goshen), Seth Bean (Connersville), Adam Bedel (Batesville), Ben Blevins (Little Miami), Kameron Block (Troy), Caleb Bolen (Madison Senior), Connor Bunts (Fairmont), Eli Cupp (Wyoming), Michael Dunn (Highlands), Chase Evans (Mason), Caleb Fawley (Beavercreek), Noah Fisher (Beechwood), Grant Hemmer (Covington Catholic), Mylan Howard (Thurgood Marshall), Andrew Jaeger (La Salle), Luke Lane (Lebanon), Clint Lorenz (Greensburg), Alex McQueen (West Clermont), Tommy Peaco (Northridge), Seth Phipps (Edgewood), Dahzuan Richardson (Fairborn), Kevan Ridley (St. Bernard), Braden Russell (Greenville), Dalton Tucker (Bourbon County), Noah Turner (Simon Kenton), Dan Troxell (New Richmond), Garrett Vanlandingham (Dixie Heights), TJ Vicars (Ross), Spencer Voss (Clinton-Massie), Nate Weber (Harrison), Jaison Williams (Trotwood-Madison) and Trent Wilson (Valley View). DL – Sam Ballman (Lakota East), Brandon Becraft (Fairborn), Austin Blankenship (Norwood), Garrett Bledsoe (La Salle), Luke Bolden (Colerain), Andy Combs (Reading), Tanner Cromer (Reading), Marshown Curtis (Mariemont), Brian Dalidowicz (Alter), Stone Day (Valley View), Charles Ellington (Butler), Kalos Farrior (Gamble Montessori), Steven Faucheux (Lakota West), Rushad Ferrell-Drummond (Thurgood Marshall), Matt Gelhaus (Madeira), Keegan Gindling (East Central), Nate Glossip (Franklin), Quinten Glover (Butler), Jevon Henderson (Centerville), Antoine Howard (Taft), Joshua Jordan (Trotwood-Madison), Tanner Lawrence (Campbell County), Malik Lee (Gamble Montessori), Bradley Lewis (Bethel-Tate), Chase Luckett (Badin), Patrick Magarian (Cincinnati Country Day), Jack Maile (Covington Catholic), Spencer Mayes (Carlisle), Thomas Meyers (Clinton-Massie), James Peters (Blanchester), Jonah Rolfes (Lawrenceburg), Trent Rogers (Anderson), Nick Sanchez (New Richmond), Joah Schricker (Troy), Austin Silcox (Harrison), James Smith (Wyoming), Jason Smith (Hamilton), Ayron Thompson (Middletown), Ramiro Torres (Blanchester), Joe Wahl (West Clermont), Michael Warden (Summit Country Day) and Armanie White (St. Bernard). LB – Blake Bacevich (St. Xavier), Trey Baker (Fairmont), Zach Ball (Lebanon), Hasan Black (Wyoming), Albert Bradford (Belmont), Evan Brown (Edgewood), Charlie Cowart (Mariemont), Matt Centers (Franklin), Quincy Dawson (Princeton), Joe Durham (Bishop Fenwick), Kyle Fehr (Sycamore), Garrett Gabbard (Edgewood), Matt Garber (Tippecanoe), Adam Graeter (Beavercreek), David Gray (Owen County), Lane Harshbarger (Alter), Isaiah Haywood (Chaminade Julienne), Tykeise Henry (Mason County), Owen Holtke (Bethel-Tate), Alex Howard (Mount Healthy), Brody Ingle (La Salle), Antwaun Johnson (Wayne), Tyreke King (St. Bernard), Tyler Long (Hughes), Luke Lovely (Preble Shawnee), Jack McDowell (Summit Country Day), Jayvanare Nelloms (Trotwood-Madison), Cam O’Gara (Wyoming), Jimmy O’Toole (Anderson), James Parker (Trotwood-Madison), Cole Pearce (Mason), Connor Pohl (Cincinnati Country Day), Keegan Rogers (Badin), John Mark Shutt (Boone County), Rocky Stark (Chaminade Julienne), Luke Szabados (Moeller), Caleb Thurmond (Northwest), JT Thornhill (Dayton Christian), Alex Thurza (Scott), Trey Uetrecht (Clinton-Massie), Derrian Wilkins (Aiken), Dalton Williams (Bourbon County) and Ethan Young (Kings). DB – Jaylin Anderson (CCPA), Deonte Bailey (Goshen), Ryan Batsch (Loveland), Alex Bernard (CHCA), Taron Britt (Trotwood-Madison), Toron Brown (Norwood), Jack Campbell (Bellbrook), De’Zion Coleman (Hughes), Jamorrow Dawson (Lloyd Memorial), Griffen Durso (Turpin), Wyatt Floyd (East Clinton), Ryan Hall (Fairmont), Robert Jackson (Riverview East Academy), Danny Lewis (Northmont), Nathan Lloyd (East Central), Clay Mastin (Tippecanoe), Avi McGary (Lakota East), Elijah McKenney (Beechwood), Jack Mitchell (Butler), David Moyer (Dayton Christian), Jamar Payton, Jr. (Dunbar), Kyle Rickard (Franklin), Zach Rytlewski (Ryle), Adam Schneider (Covington Catholic), Cecil Singleton (Princeton), Quinn Smith (Winton Woods), Lorenzo Sparks (North College Hill), Danny Spivey (New Miami), Luke Tabler (Badin) and Aaron Tolliver (Eaton). ATH – Amadou Ba (Lockland), Demarco Bradley, Jr., (Taft), Seth Chinn (Dayton), Jack Coldiron (Covington Catholic), Hunter Collins (Monroe), Keith Fisher (Clark Montessori), Bryson Flucas (Meadowdale), Twon Hines (Northridge), Timothy Jordan (Aiken), Wyatt Lefker (Williamsburg), Joe Lusby (MVCA), William McDaniel (Trotwood-Madison), Jake Moore (Carlisle), Nylan Mosley (Purcell Marian), Nick O’Meara (Brookville), Hunter Privett (Lawrenceburg), Cameron Rountree (Springboro), Jake Shirey (Little Miami), Mason Smith (Walton-Verona), Ty Smith (Owen County) and James Tucker (Franklin County). PK – Austin Abbott (Norwood), Cam Anderson (Waynesville), Nick Bowman (Highlands), Caden Browndyke (East Central), Derrick Carlisle (Clinton-Massie), Kyle Farfsing (Harrison), Brady Henry (Wilmington), Garrett Russell (Wayne), Harry Sand (Turpin), Matt Schneider (Franklin), Caiden Smith (Tippecanoe) and Yeri Velasquez (Winton Woods). P – Thomas Capano (Lakota East), Seth Clayton (Tippecanoe), Brandon Cusmano (Moeller), Grady Cramer (Highlands), Will Harshbarger (Valley View), Nick Hjort (Lakota West), Paul Kremer (Newport Central Catholic), Logan Lozier (Greensburg), Drew Nieman (La Salle), Logan Persson (Indian Hill), Joe Valentine (Ross), Brandon Walters (Centerville), Jalen Watson (Trotwood-Madison) and Austin Weimer (Lawrenceburg). RET – Evan Baugh (Milford), Milyke Brown (Withrow), Corey Burnette (Xenia), Austin Clark (Valley View), Jordan Coovert (Alter), Devon Donawerth (East Central), Jared Kinzer (Franklin), Zach Kuhlman (Roger Bacon), Peyton Leugers (Goshen), Keshaun Owens (Chaminade Julienne) and Brady Wilson (Stebbins). TriStateFootball.com (TSF) provides year-round coverage of 172 high school football teams from Southwest Ohio, Northern Kentucky and Eastern Indiana.